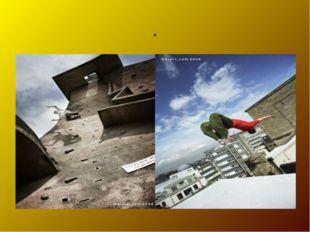 Презентация на английском языке "Молодежные субкультуры. 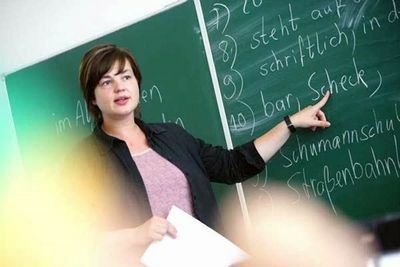 Паркур"
Инфоурок › Иностранные языки ›Презентации›Презентация на английском языке "Молодежные субкультуры. 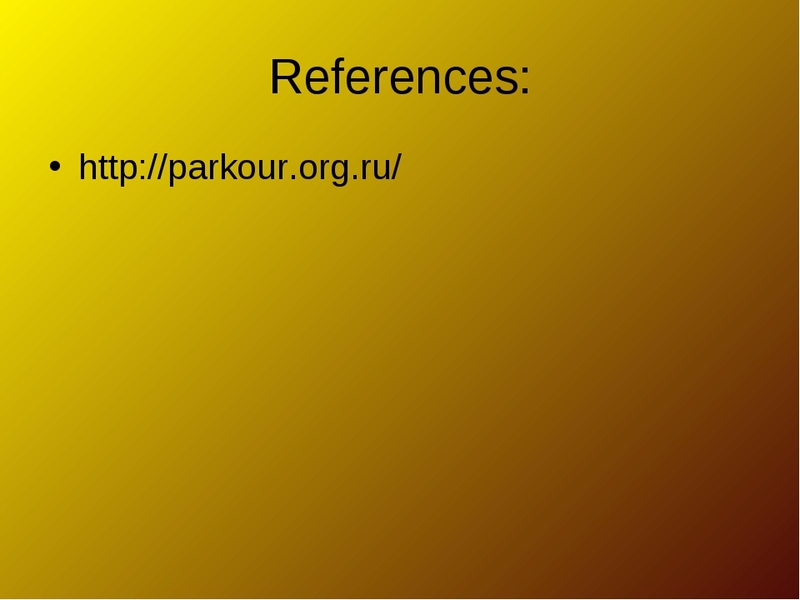 Паркур"
What is Parkour? 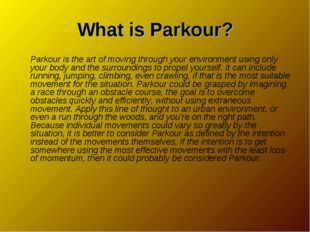 Parkour is the art of moving through your environment using only your body and the surroundings to propel yourself. It can include running, jumping, climbing, even crawling, if that is the most suitable movement for the situation. 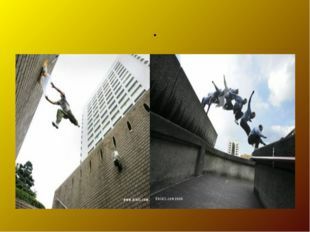 Parkour could be grasped by imagining a race through an obstacle course, the goal is to overcome obstacles quickly and efficiently, without using extraneous movement. 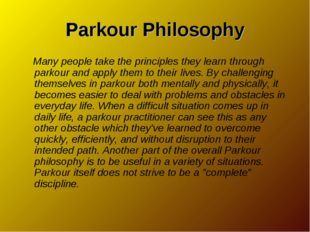 Apply this line of thought to an urban environment, or even a run through the woods, and you're on the right path. 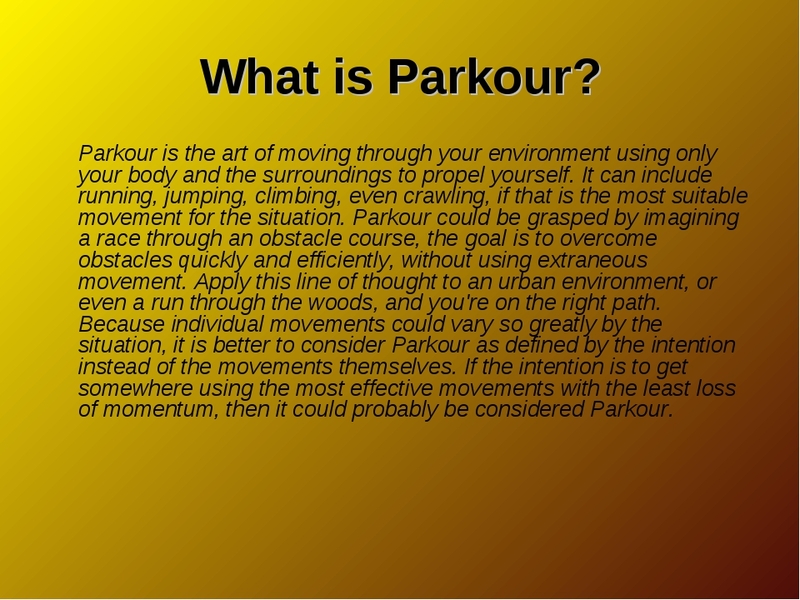 Because individual movements could vary so greatly by the situation, it is better to consider Parkour as defined by the intention instead of the movements themselves. 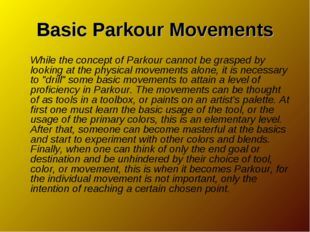 If the intention is to get somewhere using the most effective movements with the least loss of momentum, then it could probably be considered Parkour. What isn't Parkour? Parkour is not acrobatics, tricking, stunts, recklessness, or jumping off high objects for no reason. 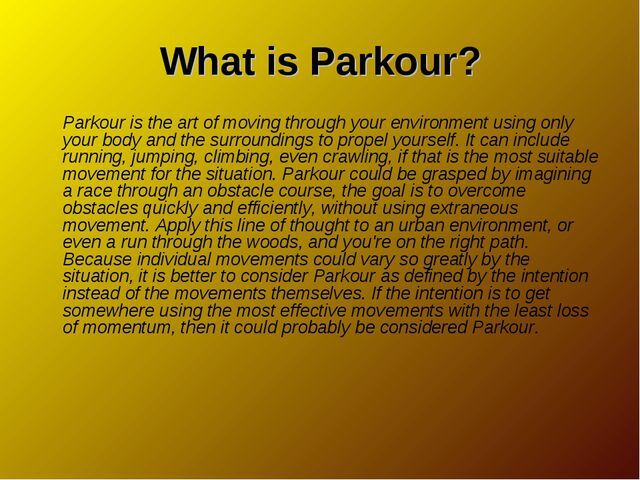 It is not any movement or activity that doesn't fit in the above description "What Parkour Is". 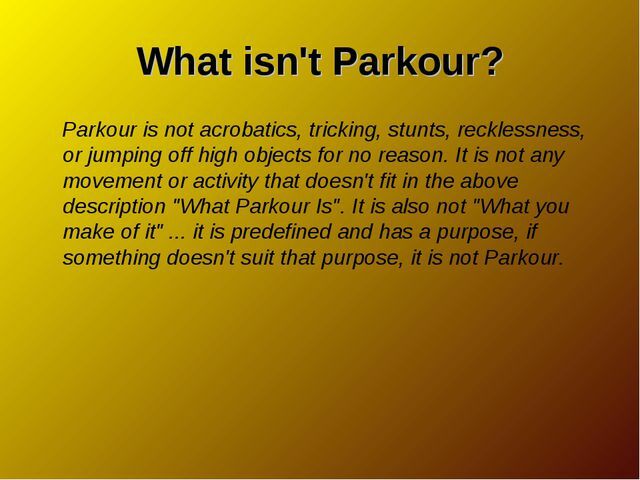 It is also not "What you make of it" ... it is predefined and has a purpose, if something doesn't suit that purpose, it is not Parkour. 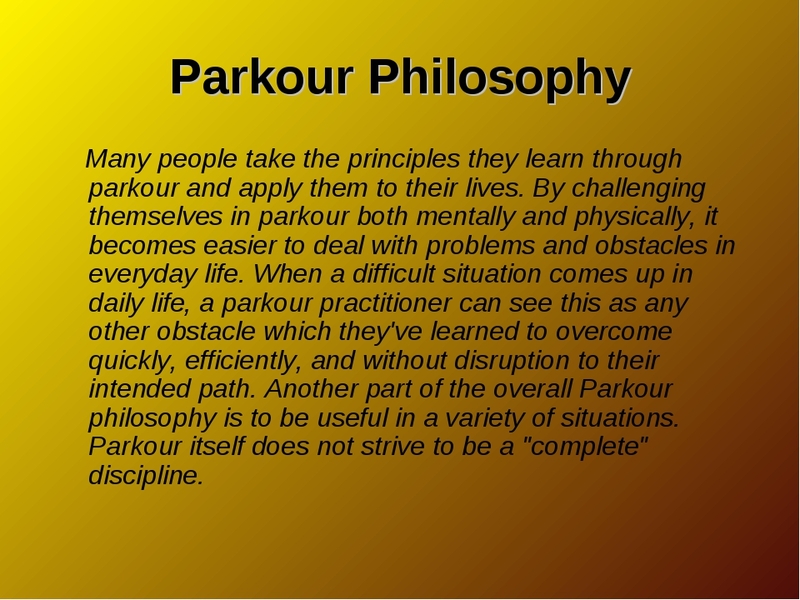 Parkour Philosophy Many people take the principles they learn through parkour and apply them to their lives. 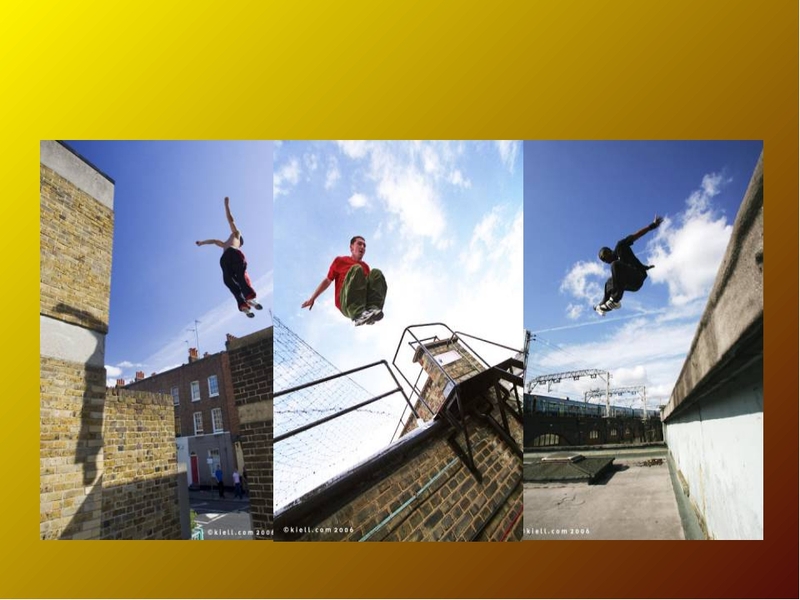 By challenging themselves in parkour both mentally and physically, it becomes easier to deal with problems and obstacles in everyday life. 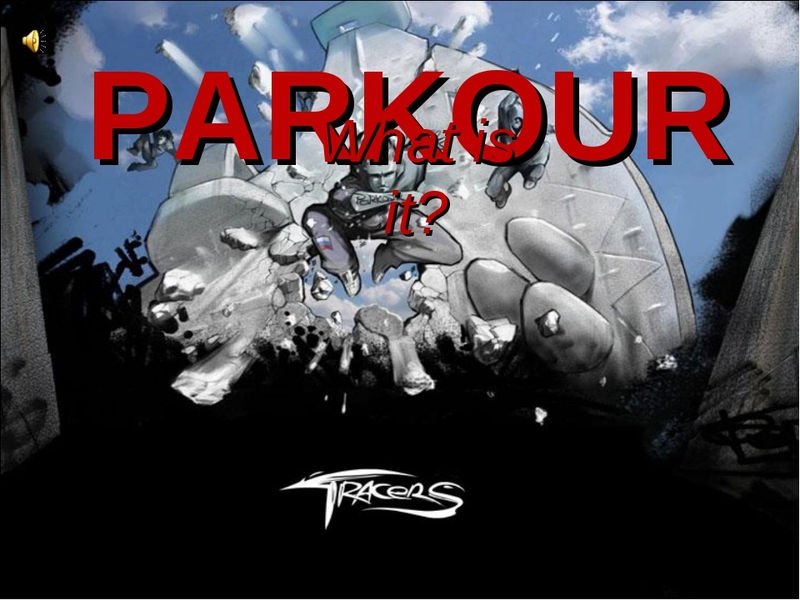 When a difficult situation comes up in daily life, a parkour practitioner can see this as any other obstacle which they've learned to overcome quickly, efficiently, and without disruption to their intended path. Another part of the overall Parkour philosophy is to be useful in a variety of situations. Parkour itself does not strive to be a "complete" discipline. Basic Parkour Movements While the concept of Parkour cannot be grasped by looking at the physical movements alone, it is necessary to "drill" some basic movements to attain a level of proficiency in Parkour. The movements can be thought of as tools in a toolbox, or paints on an artist's palette. 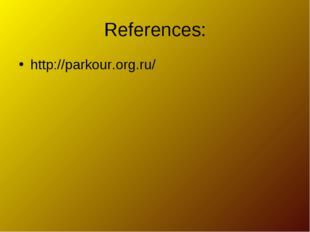 At first one must learn the basic usage of the tool, or the usage of the primary colors, this is an elementary level. 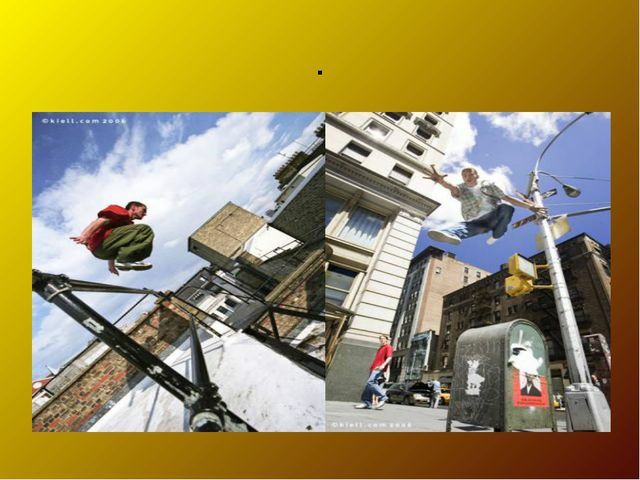 After that, someone can become masterful at the basics and start to experiment with other colors and blends. 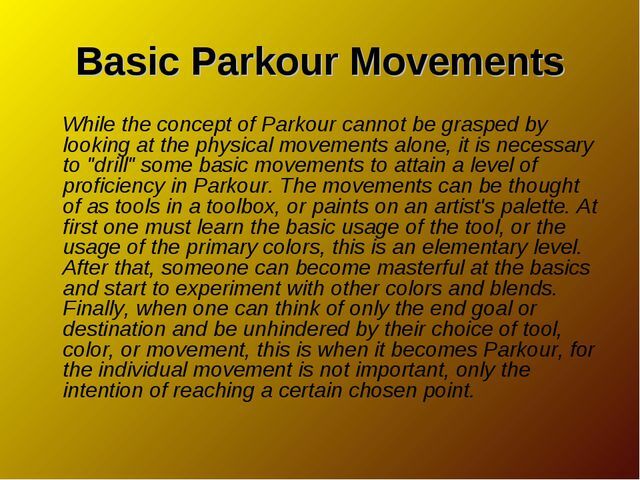 Finally, when one can think of only the end goal or destination and be unhindered by their choice of tool, color, or movement, this is when it becomes Parkour, for the individual movement is not important, only the intention of reaching a certain chosen point. 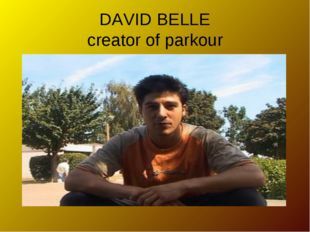 Belle was born and raised in Seine Maritime, Normandy. He descended from a modest family in the suburbs of Paris. 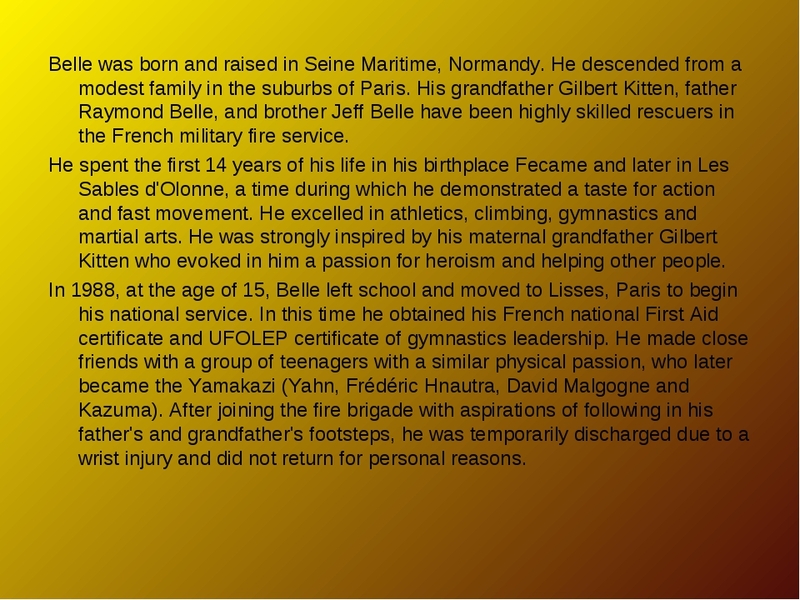 His grandfather Gilbert Kitten, father Raymond Belle, and brother Jeff Belle have been highly skilled rescuers in the French military fire service. 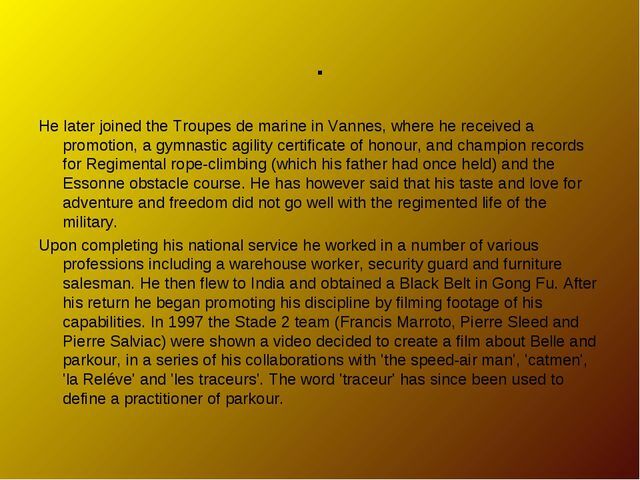 He spent the first 14 years of his life in his birthplace Fecame and later in Les Sables d'Olonne, a time during which he demonstrated a taste for action and fast movement. 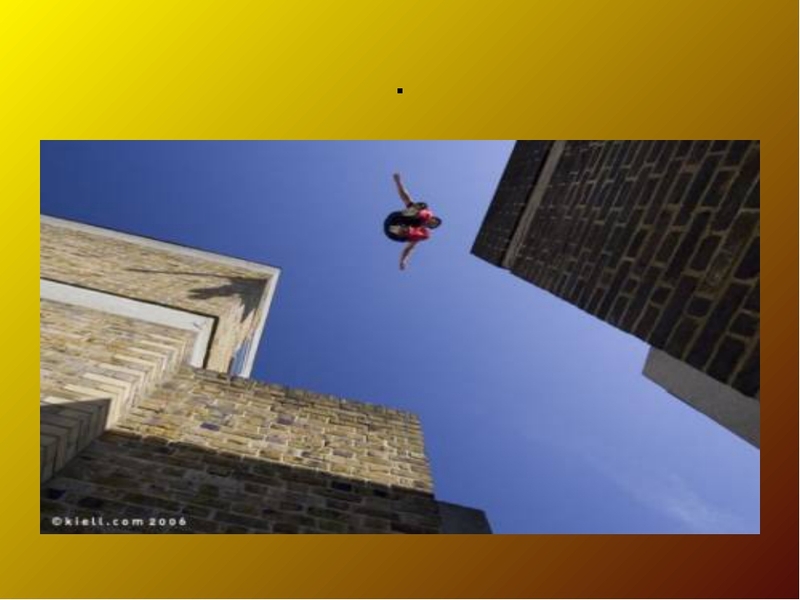 He excelled in athletics, climbing, gymnastics and martial arts. He was strongly inspired by his maternal grandfather Gilbert Kitten who evoked in him a passion for heroism and helping other people. 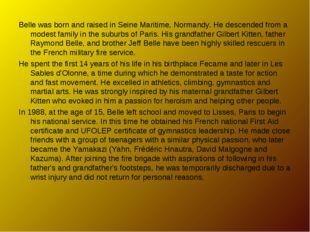 In 1988, at the age of 15, Belle left school and moved to Lisses, Paris to begin his national service. 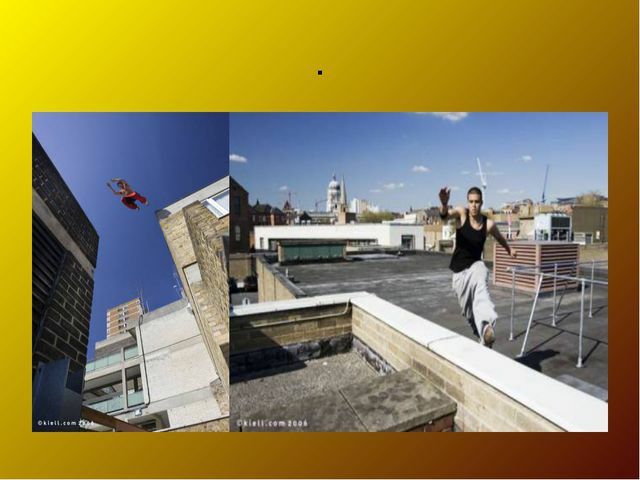 In this time he obtained his French national First Aid certificate and UFOLEP certificate of gymnastics leadership. He made close friends with a group of teenagers with a similar physical passion, who later became the Yamakazi (Yahn, Frédéric Hnautra, David Malgogne and Kazuma). 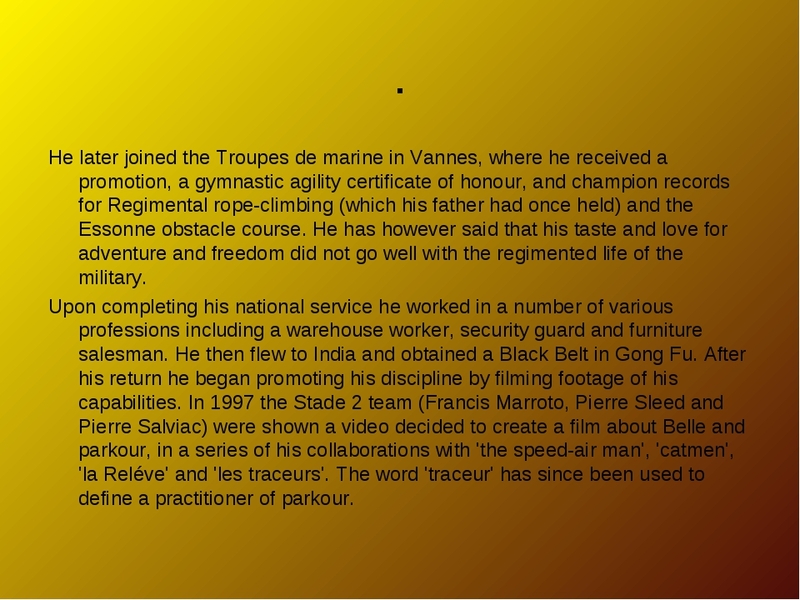 After joining the fire brigade with aspirations of following in his father's and grandfather's footsteps, he was temporarily discharged due to a wrist injury and did not return for personal reasons. 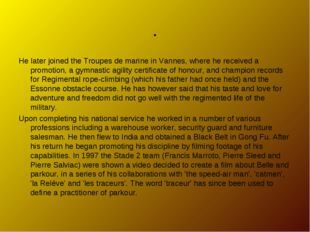 He later joined the Troupes de marine in Vannes, where he received a promotion, a gymnastic agility certificate of honour, and champion records for Regimental rope-climbing (which his father had once held) and the Essonne obstacle course. He has however said that his taste and love for adventure and freedom did not go well with the regimented life of the military. 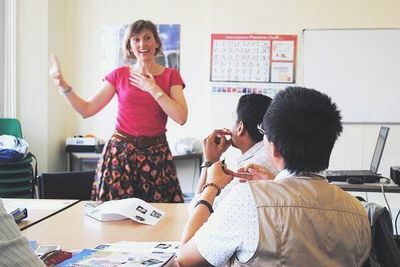 Upon completing his national service he worked in a number of various professions including a warehouse worker, security guard and furniture salesman. 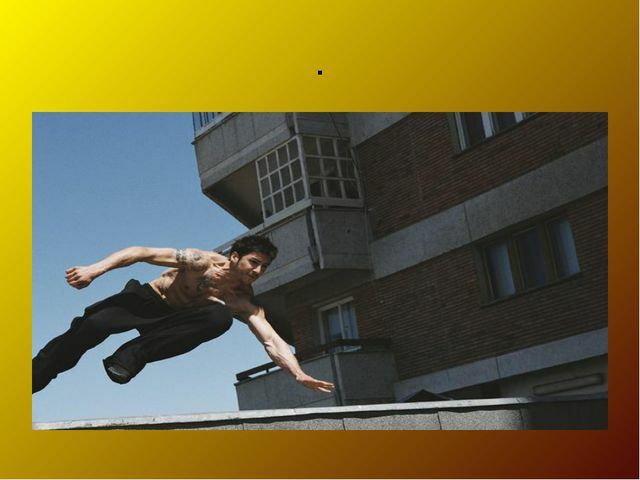 He then flew to India and obtained a Black Belt in Gong Fu. After his return he began promoting his discipline by filming footage of his capabilities. In 1997 the Stade 2 team (Francis Marroto, Pierre Sleed and Pierre Salviac) were shown a video decided to create a film about Belle and parkour, in a series of his collaborations with 'the speed-air man', 'catmen', 'la Reléve' and 'les traceurs'. The word 'traceur' has since been used to define a practitioner of parkour. .
David Belle in a chase sequence from Banlieue 13. 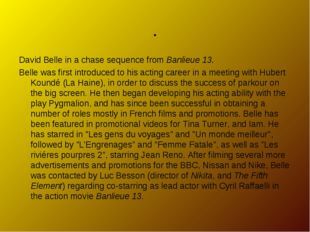 Belle was first introduced to his acting career in a meeting with Hubert Koundé (La Haine), in order to discuss the success of parkour on the big screen. 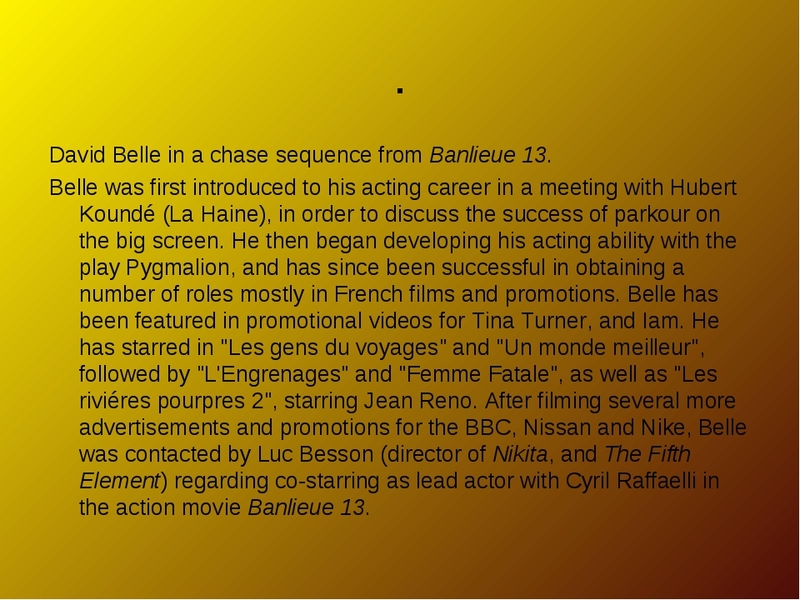 He then began developing his acting ability with the play Pygmalion, and has since been successful in obtaining a number of roles mostly in French films and promotions. Belle has been featured in promotional videos for Tina Turner, and Iam. He has starred in "Les gens du voyages" and "Un monde meilleur", followed by "L'Engrenages" and "Femme Fatale", as well as "Les riviéres pourpres 2", starring Jean Reno. 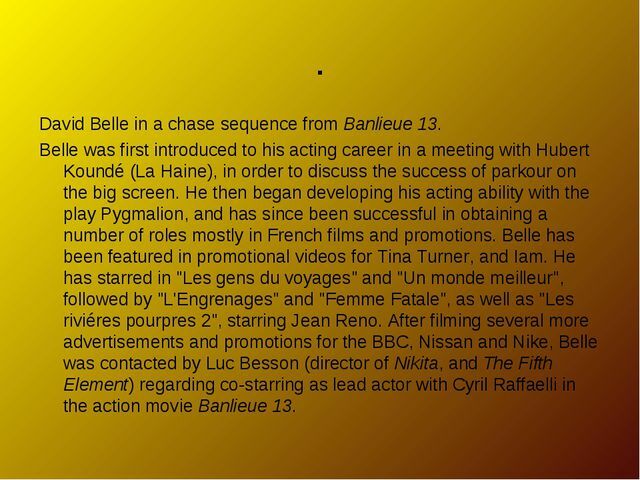 After filming several more advertisements and promotions for the BBC, Nissan and Nike, Belle was contacted by Luc Besson (director of Nikita, and The Fifth Element) regarding co-starring as lead actor with Cyril Raffaelli in the action movie Banlieue 13. .